Perhaps the most serious worry for the tax and benefit proposals I present in Rethinking Taxation is that they would open up the possibility for fraud. One reason is because the introduction of hour credits that impact upon people’s income also creates a new form of fraud, hour credit fraud. I have several responses to such a concern, several of which are presented in my book, as well as in past and future blogs. One point is that there would be a maximum amount of hour credits each person could claim in a given period, and another is that the fraud of over-claiming on hour credits would in some cases replace existing forms of over-claiming on benefits and tax exemptions. I also propose a demanding comprehensive acquired income tax base, which also creates new forms of tax fraud. This is more demanding, but I think that it is more principled and that it is better to have a principled tax base that people defraud rather than one that gives in to difficulty. You might wonder what this has to do with my current series of blogs about technology. I wish to emphasise how technology can help to find instances of fraud, make the above forms of fraud much less likely and therefore allow a more progressive and principled tax regime. Here are five ways technology can make tax collection simpler, improve compliance and detect fraud. 1. Greater links between financial transfers and taxation. In a recent blog "technology and tax-collection" I outlined my proposal for financial institutions to withhold tax. If this were the case, then there could be a presumption that any income is taxable unless it is proven otherwise. Those engaged in tax base fraud would have to either go to great lengths to convince the authorities that their income was not in fact taxable income, and doing so repeatedly would arouse suspicions. This would push fraudsters further away from mainstream forms of finance and thereby make such activities less rewarding. 2. Electronic transfers rather than cash. Another point highlighted in previous blogs is the trend towards the use of electronic transfers rather than cash and that I would expect this trend to continue. Cash is preferred for those engaging in tax fraud and other criminal enterprises and so a reduction in the amount of cash in society means that it will become more and more difficult to generate income from illicit activities and to then utilise these gains in the mainstream economy. One counter-argument to this is to say that a black market would spring up that would use an alternative currency—like cigarettes in prisons. However, this would be a risky option. The value of such a currency (or currencies) would be unstable without government backing and it would be easily possible for the authorities to disrupt the currency. Furthermore, when it is disrupted those reliant upon the currency will lose all. 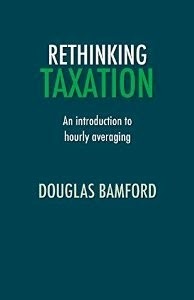 The ultimate point is that the effort that people would have to go to would mean that most would find it easier to just join the mainstream economy (after all being at the bottom of the mainstream economy under the CLIPH-rate tax would not be so bad). 3. Employer’s use of IT can be helpful. I think one of the strongest responses to claims that there will be a lot of hour credit fraud alongside hourly averaging is to highlight that firms want to get as much as possible from the workers they employ. We can expect firms to compete for workers and so firms engaging in hour credit fraud will have a different internal and payment structure than their competitors. This should be picked up using the methods outlined below. The point to make under this heading is that employers are going to use IT systems to improve productivity and generate data that would be useful to verify hour credit claims. One worry is that firms engaging in fraud could create two systems, just as dodgy firms can have a fake set of accounts for the tax authority in addition to their real ones. So this method won’t guarantee to catch fraudsters on its own, but it would at least make the process of assessment easier and give fraudulent firms a disadvantage over honest ones. b) Monitoring job applications and company structures. Another suggestion in Rethinking Taxation to counter hour credit fraud is to record and monitor job application processes and internal job changes. Employers should provide some basic information during the job application process (again, easily transferrable electronically if systems are designed to be minimally compatible or produce files of the required kind), the kind of work and the hourly pay rate or salary offered. Similarly, the information listed in 3a) and 3b) (along with information about who is approving hour credits for whom where relevant) will enable the tax authorities to build up a profile of the structure of the organisation. Investigators could use this information to find organisations which are atypical in their industry and help to target investigations to find suspicious firms and suspicious departments within otherwise typical firms. c) Cross-referencing employer and employee statistics. The tax authority could cross reference hourly average pay for different workers performing similar roles to see whether some firms are paying much less per hour. Those firms which are can be investigated to see whether they are over-claiming hour credits for their part-time workers and therefore defrauding the rest of society. The penalties for firms engaging in such practices would be severe, and managers and directors involved would lose their right to hold such positions for a while. Another way technology can help uncover those engaging in tax base fraud is to cross reference income and spending patterns and to analyse this in order to pick out those who are most likely to be receiving income fraudulently. As the options for spending and laundering money outside of recorded transactions reduce those with illicit income will be easier to detect as their income and spending habits might be atypical. The methods outlined above should help uncover hour-credit fraud as well as tax-base fraud. People and firms whose hourly average payments change in unexpected ways can be flagged up for further investigation. A lot of the points I have raised above are about directing investigations towards the most suspicious individuals and employers. This may result in false positives, of course, but directing investigations in the above manner will be much more effective than reliance upon random investigations and regularly scheduled audits alone (and these are also important). The point is not that these measures will always be effective, but that they will also require fraudsters to go to greater lengths to cover their tracks and make them seem legitimate. Going to these lengths greatly increases the costs of the illicit activities and therefore discourages them. Furthermore, in a society with hour credits fraudsters would need to obtain hour credits in order to receive any income and partake in the society (people who do not receive any official would only be able to get by if they are beggars, beachcombers or smallholders). This means that they will have to try to launder their gains through registered employers and provide a lot of information to the authorities. 4. Using the above information will help uncover and disrupt criminal organisations. This means not only that criminal enterprises would have to put huge amounts of resources into creating front activities, but also that they would end up linking all of their associates together through the web of transfers and false employment contracts and hour credit claims. I believe the above listed anti-fraud detection procedures would have a powerful impact on fraud. This would make large scale organised criminal activity, which is often the most violent and harmful, very difficult. There might be more ways in which people could commit fraud, but criminals would need to keep their fraudulent activities at a very small scale in order to avoid arousing suspicion. It would be hyperbole to claim that the CLIPH-rate tax would stamp out organised crime and corruption, but it would certainly make it much harder to benefit from such activities. The additional costs of doing so, and the greater likelihood of catching those who do engage, could be expected to greatly reduce the amount of crime taking place. There are legitimate concerns that big business and big government will use technology to monitor consumers and citizens in order to have more control over them. However, rather than attempt to stop the tide of technology, I think that the best way to stop these developments getting out of hand is to use these technologies to create a more equal and transparent societies with strong checks and balances.